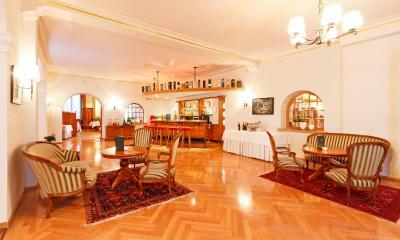 Lock in a great price for Edelweiss Swiss Quality Hotel – rated 9.2 by recent guests! Excellent , prime location! Hiking trails judt outside the door. Location, cleanliness and the staff very friendly and helpful I really recommend this hotel to everyone. The hotel staff were so accomodating. The room is very swiss. It's like staying in a cabin lodge. Breakfast room was superb. The sauna is brilliant. Location is very central. Not far from the bus stop. Definitely coming back if there is a chance. Amazing breakfast, amazing location, great staff, extremely clean, nice little spa after a day hiking, amazing little village (way better than St Moritz). Nice surprise. 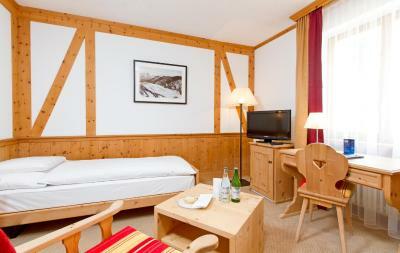 Very nice standard, despite reasonable price for the single room. Friendly reception. Quiet room in modern classic standard. very clean. 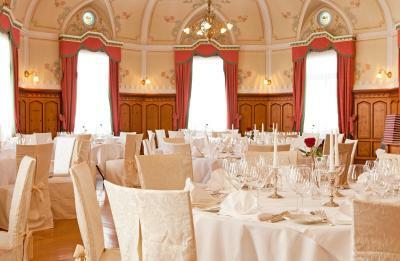 Good breakfast in wonderful decorated room. Locked skiroom. Very close to cross country tracks. The wellness sauna was also spanking clean and very nice. The finnish sauna is separate to low heat saunas, not a problem, well organised dressing rooms there. Bathrobe provided. As I came back from XC at around 15, there was hardly anyone there, cant say how full the wellness gets in the evening or high season. Didnt try the restaurant other than breakfast. Fast internet in the lobby. Great hotel. Excellent location. Very helpful and friendly staff. The food in the restaurant and at breakfast was quite good. The quality of the food in the reasturant was excellent as was the resident pianist. Management making personal contact with you during your stay, interested, friendly and helpful following a rocky start about parking of motorcycle. Edelweiss Swiss Quality Hotel This rating is a reflection of how the property compares to the industry standard when it comes to price, facilities and services available. It's based on a self-evaluation by the property. Use this rating to help choose your stay! 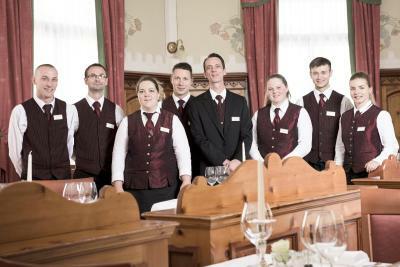 Since 1876, Hotel Edelweiss has provided comfortable accommodations in the romantic village of Sils-Maria, just 10 minutes' drive from the famous St. Moritz. 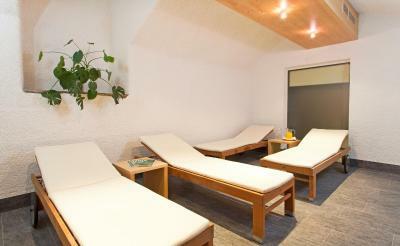 A fitness center and pampering spa treatments are available. 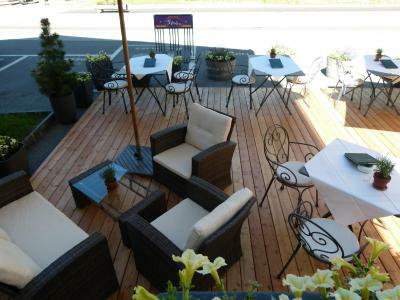 Parking and WiFi throughout the property are free of charge. Featuring Arven wood furniture, the comfortable rooms come with a TV, mini-bar and heating. Private bathrooms have a shower. 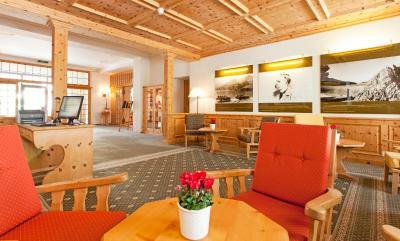 Hotel Edelweiss is a very good starting point for many walking trails and ski trails through the countryside. 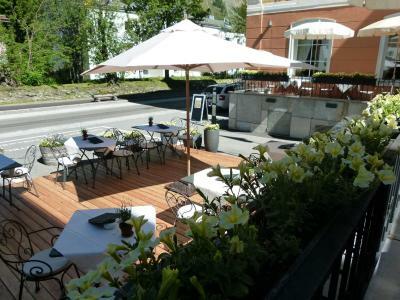 It is 2,150 feet from Ski Elevator Furtschellas and the Lugano Airport is 50 mi away. Depending on the season, guests can play tennis or mountain bike during summer, or ice-skate during winter. 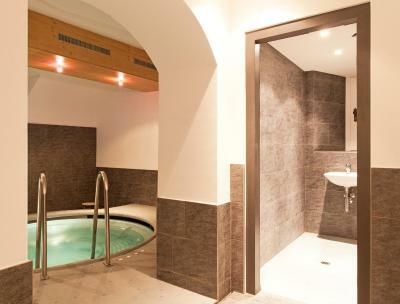 The wellness center features a Finnish sauna, steam baths and hot tubs. 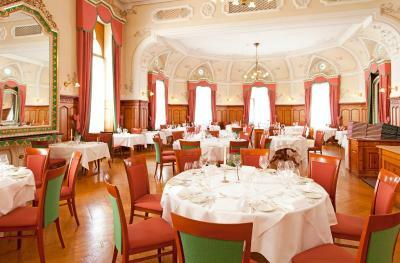 The Art Nouveau-style restaurant serves a delightful buffet breakfast every morning. Room service is also available. This is our guests' favorite part of Sils Maria, according to independent reviews. 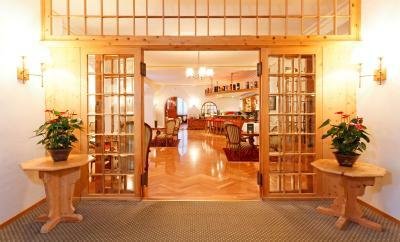 This property also has one of the top-rated locations in Sils Maria! Guests are happier about it compared to other properties in the area. 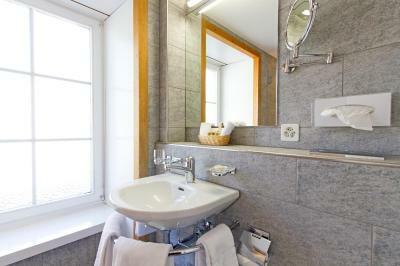 This property is also rated for the best value in Sils Maria! Guests are getting more for their money when compared to other properties in this city. 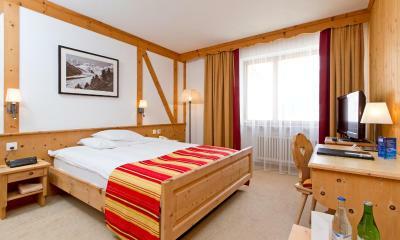 When would you like to stay at Edelweiss Swiss Quality Hotel? All rooms feature Arven wood-paneled walls. All rooms feature Arven wood-paneled walls and seating areas. All rooms feature Arven wood-paneled walls and queen-sized beds. All rooms feature Arven wood-paneled walls, private bathroom with shower and bathtub, separate hallway and a walk-in wardrobe. 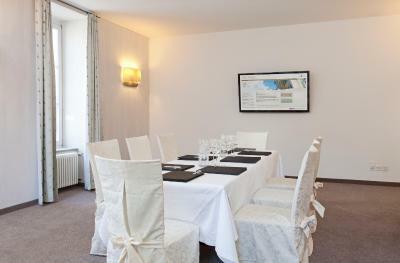 Since 1876, Hotel Edelweiss has provided comfortable accommodation in the romantic village of Sils-Maria, just 10 minutes' drive from the famous St. Moritz. 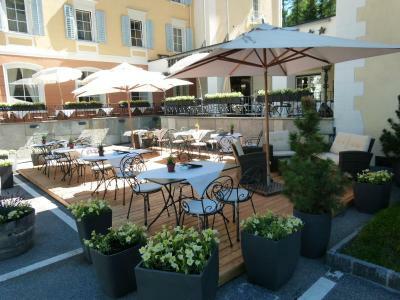 The Hotel Edelweiss (4 star) ist the oldest hotel in the village with a great Art Nouveau-style restaurant. 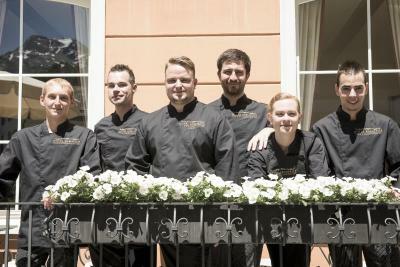 House Rules Edelweiss Swiss Quality Hotel takes special requests – add in the next step! Edelweiss Swiss Quality Hotel accepts these cards and reserves the right to temporarily hold an amount prior to arrival. Compared to a lot of other often overpriced bit run down hotels in Switzerland this place was truly a very nice surprise. Cant fault anything really. There was a problem with the internet in my room (regular drops outs, slow) but I think that had more to do that my room was a corner room. I informed the reception and they will look into it with a technician. So probably fixed by now. Not much choice for restaurant I really recommend a fast food restaurant in this area. The room was a bit small and the bed was quite small. Motorcycles being asked to park out of site at the rear. This was a bad mistake. Complained about this and offered free secure parking in hotels garage. Pity this happened as I don't like being stereotyped. My motorcycle was far more expensive than some of the cars parked in front of the hotel. The issue was resolved but spoilt an otherwise excellent stay. Nothing like .. didn't like .. but there is no electric kettle provided in the rooms to prepare early morning coffee / tea once you get up .. that was lot inconvenient for people like us who are accustomed to have a cup of tea after getting up .. The people .. yes, the people are the most likeable .. they make you very comfortable and helpful .. Laura, Jennifer, Martina all whom I interacted with and the Main Person .. name I forgot 🙂.. 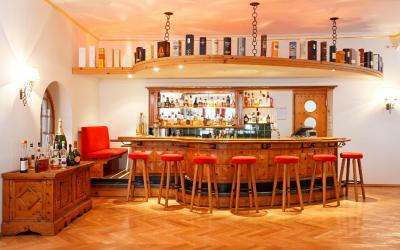 The location, ambience, layout, naturalised interiors, vintage looks .. all were so very nice.. Chef was helpful in cooking rice & vegetables for us too .. 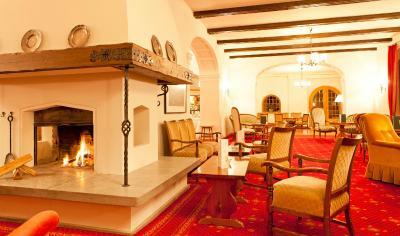 It would have been good to have a kettle in the room for an early morning cup of tea or an evening drink. Single rooms were a good size and the bathrooms were well appointed. Dinner in the hotel restaurant was excellent, with excellent service.